Rudy Giuliani raised $11 million for the presidential race this summer, outpacing fellow Republicans, though Mitt Romney was right behind with $10 million and tapped his own fortune to pump additional millions into the battle. 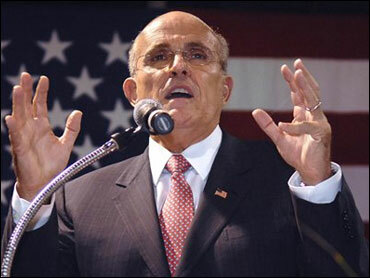 Giuliani's campaign income for the July-September quarter left him with $16 million cash on hand, aides said Thursday. Of that, about $12 million is available for the primary contests. Romney had $9 million on hand for the battle for the Republican nomination. Taking a break from attacking Hillary Clinton, Giuliani and Romney have turned on each other in a brewing Republican rivalry that is getting hotter, reports CBS News national correspondent Byron Pitts. Nationally, Giuliani is the clear frontrunner in the Republican pack, but in Iowa and New Hampshire it's Romney who leads the pack. Romney contributed $8.5 million to his own campaign, a total that nearly matched his personal contributions for the first six months of the year. Overall, Romney, a former venture capitalist and Massachusetts governor, has dipped into his personal wealth for nearly $17.5 million. John McCain, fighting to get back in the fray with the Republican front-runners, raised $6 million in the past three months and has $3.6 million cash on hand, his campaign said. McCain aides said the fundraising and the financial condition of his campaign represent a turnaround for the Arizona senator, whose spending during the first six months of the year strained his budget while his polling numbers plummeted. McCain was expected to report a debt of about $1.5 million, less than he reported at midyear. Romney's ability to write his campaign checks has given him the resources to spend heavily on advertising throughout the year, particularly in Iowa where he was hardly known when he began his presidential effort. His assets are estimated at between $190 million to $250 million, making him the wealthiest of all the candidates in both parties. "Writing checks is always painful for me, no matter what it's for, but I nonetheless recognize this is a critical race," Romney told reporters in Manchester, N.H., on Thursday. "There is nothing more important to me than the success of this nation, and I know a lot of people are sacrificing to help my campaign, and I will certainly be contributing in my own campaign." "The campaign is focused on building a nationwide fundraising network of volunteer donors and supports," Romney spokesman Kevin Madden added. "That will continue. The personal resources the governor has put into the campaign have helped sustain the campaign's growth. But the focus remains on building a national grassroots effort, as evidenced by our ability to compete with other Republican campaigns that have greater name awareness and who lead in the national polls." So far in the presidential contest, Romney has raised about $45 million from contributors. With his own money, the campaign's total receipts are more than $62 million. Giuliani is not far behind with more than $44 million, but about $4 million of that can be spent only in the general election - if Giuliani wins the nomination. Romney is not raising any general election money. The two Republicans lag far behind the two Democratic Party money leaders - Clinton and Barack Obama. Clinton has raised about $63 million for the primary and about $17 million for the general election. She also has transferred $10 million left over from her 2006 Senate campaign. Obama has raised about $75 million for the primary contest and about $4 million for the general election.